One of the most special gifts to purchase for your synagogue these days are our memorial plaques. We a now have them available in several different designs, making it much easier to buy the one that matches your taste that you feel will suit the occasion. If you do want to get hold of special memorial plaques from us at Or-El today, you should know that we sell these fitted with the safest LED lighting, making it a hazard free product for every purpose you desire. Note that the memorial plaques are not an excepion - Lighting used in all of our products has been switched from toxic mercury-laden fluorescent lighting to the smaller footprint and more environmentally friendly LED. LED lighting consumes less power, provides higher-intensity and better distributed lighting and heat as well as increased life expectancy. The memorial plaques that you can buy from us at Or-El are made of special materials. You can engrave the names of whoever you want in them with the font and size you want. 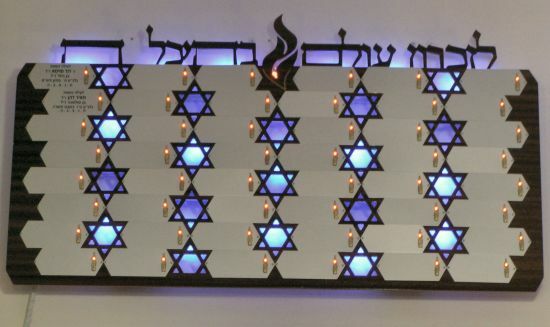 This is why we have so much selection for you to choose from, in order to make it easier for you to make the crucial decision in buying the memorial plaque or memorial plaques that will find their way in the synagogue. Things have changed a lot in recent years. When speaking of the Jewish communities in the US, Europe and Israel, there has been an increasing demand for memorial plaques. This is due for a number of reasons. Maybe the most fundamental is the desire to modernise Jewish institutions, especially synagogues. If you are looking to purchase special merchandise today, now is the perfect time. With all of the best memorial plaques presented, you really do need to check out what we have in store for you!